Your users’ experience in terms of navigating your site should be reason enough for performance tuning a site. Users have many options when it comes to consuming content on the internet, and a slow performing website will frustrate them and send them to another site. A faster and more responsive website will keep them more engaged and focused on your content, rather than waiting for scripts and images to load. SimpleTags is my prefer automatic tag generating plugin. It greatly simplifies tagging your posts and it’s just an all around well done plugin. One problem: It doesn’t work with the latest version of WordPress… or does it? After my initial upgrade I simply thought the author Amaury BALMER was just a little behind the curve in updating the plugin… or *gasp* maybe it wouldn’t be supported in the future. Perhaps both are true, but after a quick search in the plugin repository I discovered that there is nothing that prevents SimpleTags to work except that there is a hard coded WordPress version check in there. This isn’t a BAD thing… maybe the later versions of WP wouldn’t work with it? Who knows… but the solution to resolving the issue is pretty straight forward and simple. s3Slider – One of the most common types of “Featured Post” displays (and the one I use). JSGallery – Maybe you want no words and only the post thumbnail images to display. Agile Carousel – Another powerful jQuery slideshow-like plugin. Since the side work business seems to be kicking up again I decide to roll out a separate site for my consulting services. The new site can be found at http://consulting.paulspoerry.com. It’s still a bit of a work in progress but feel free to swing by and check it out. Just upgrade to WordPress 2.7 and wonder how to enable Google Gears? Gears is a plug-in that extends your browser to create a richer platform for web applications. You can use Gears on websites to let access information offline or provide you with content based on your geographical location. To install Gears, visit http://gears.google.com. It’s pretty cool and really speeds things up. For WordPress it is used to store all images and other web page components from the admin area to you local PC, speeding up access and reducing unnecessary web traffic. Prior to 2.7 the admin dashboard had a “Turbo” button at the top… you’d click that and if you had Gears installed you were good to go. 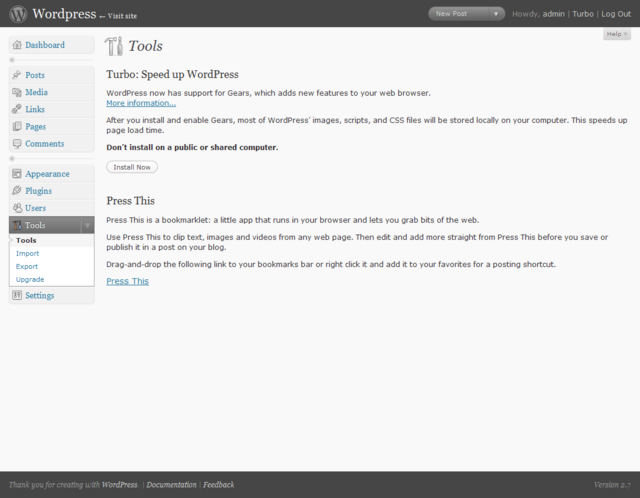 In WordPress 2.7 the “Turbo” button has been removed. To enable gears login to your Admin section and go to the Tools SubPanel. Once there you have the ability to use Google Gears to make WordPress work in a “Turbo” mode. In addition, the “Press This” bookmark tool is detailed.